Malai tinda is one recipe that will convert a tinda hater for sure. I have witnessed it myself and I think the key is in making the food look good even if it has a bad reputation regarding taste and texture. Every tinda hater I came across wouldn’t even touch a regular tinda subzi if served along with other foods but when it is in the form of Malai tinda or shahi tinda that I make, they won’t even bother asking what subzi is it. They will pick up, eat, take second helpings and rarely realise it was tinda, more because one bad experience with tinda turned them off for ever and they really don’t know how it taste like. Many punjabi homes cook tinda with loads of tomatoes and onion and though I like that recipe too, my favourite will this malai tinda and the achari tinda that I make sometimes. The shahi tinda is great too but I cook it rarely. Tinda chana dal is made when I have to make a quick meal that tastes great too. 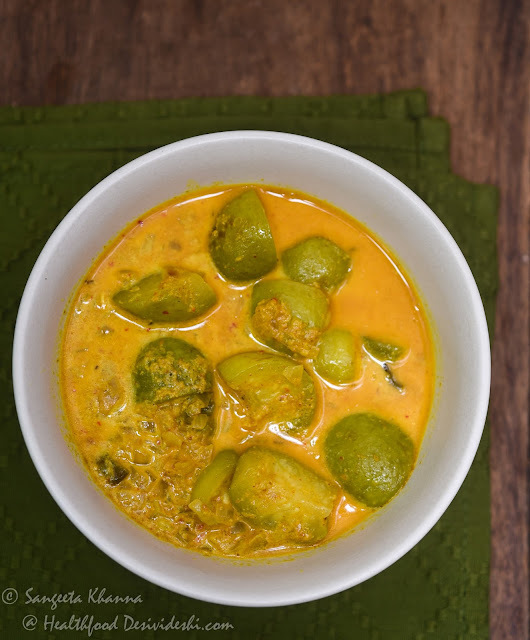 In fact tinda takes the flavour of its cooking medium quite well, if seared for a few minutes and then cooked with whatever flavour you want to infuse it with. And yes, there are some flavour that don’t go well with tinda, the doodh wali lauki or lau shukto when cooked with tinda was a big failure. Imagine similar sounding vegetables have such finer nuances in terms of flavour pairings. There are many versions of malai tinda made in punjabi families and some of them are quite rich with cashew paste and loads of malai (cream). This recipe of malai tinda has been adopted to my family’s taste and has undergone a few changes over the decades it is being cooked in my home, the original recipe came from some family friend as much as I remember. Clean the tinda surface, no need to peel them, and chop each one of them in quarters. Heat the oil, add green chili, chopped tinda and onions at once. Stir fry at high for a minute, lower the heat and add the tejpatta. Keep stir frying till the tinda quarters get a little brownish patches around the edges. Add all the powdered spices and stir fry for a minute so the spices turn aromatic, pour the milk, lower the heat to minimum and cover the pan to cook for 8-10 minutes or till the tindas are cooked through. The cooking time depends on how tender the tindas are. Once cooked, add the malai, stir gently and empty the malai tinda in the serving bowl. Adding the malai at the last step brings out the creamy colour beautifully. To make the malai tinda richer, you can add 1-2 tbsp of cashew paste along with the malai or just increase the quantity of malai. Some people like to add kasoori methi to the malai tinda but I like it plain. But I make it hot many a times with an extra dose of chili, ginger juice and pepper sometimes, you might try doing that if you like hot curries. The best thing is, that malai tinda taste great with our multigrain rotis and multigrain sourdough kulchas that is regular in my home. It is great with any type of roti, paratha or even poori I suppose, though I have never tried it with pooris. Do try the recipe and let me know how malai tinda treats you.